In August 1984 IBM released the 286-based IBM AT computer. Like the PC and XT it was primarily intended to run DOS. However with the increased power there was a void in the market for a more powerful desktop multitasking system. Unixes were not really suitable for desktops, and Microsoft were dragging their feet releasing Windows. 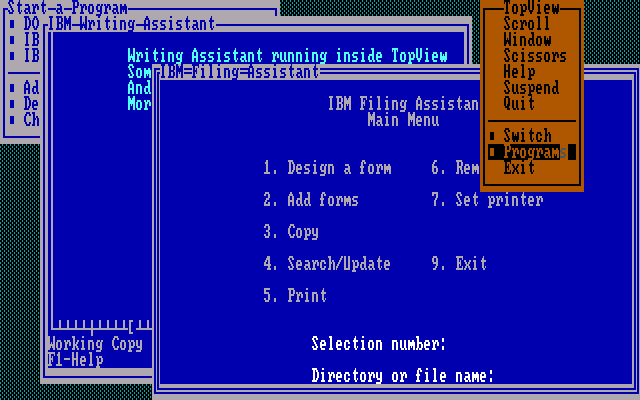 To that end, IBM released TopView, a multitasking system for DOS programs running on IBM PC, XT, and AT computers. 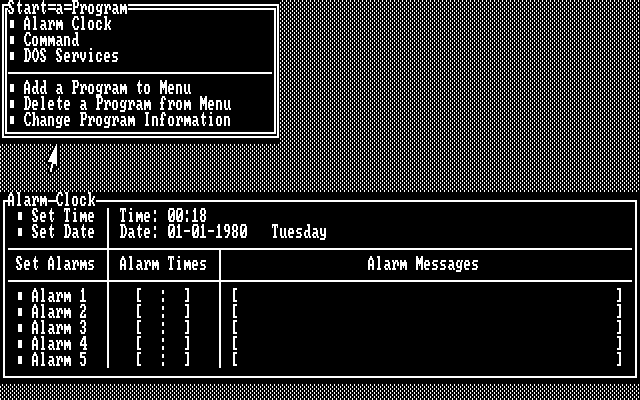 TopView will preemptively multitask a number of supported DOS applications. Well behaved applications may display their output in overlapping windows. It supports navigation with the use of a Microsoft Serial Mouse or Mouse Systems Mouse. It also has facilities to transfer text between applications. TopView introduced the use of Program Information Files (PIF files). Interestingly, TopView could be considered more than just a multitasking program. One of its lesser used features, TopView could run in CGA graphics mode. (run "TV /G") Although it has no GUI to speak of, instead using the same text-based interface, and there is no indication it can do anything with existing graphical DOS applications, it seems it could have been expanded in this way. Reportedly, it was possible to create "native" as well as "TopView aware" applications. But it seems no such applications ever materialized. There were some strange theories floating around that TopView was intended to help lock users in to IBM mainframe offerings. Had TopView gained popularity with IBM controlling the APIs, it could have been possible. More importantly, focus would have shifted from "IBM PC/DOS compatible" to "TopView compatible" software. However, in the end, TopView was too resource heavy for most. 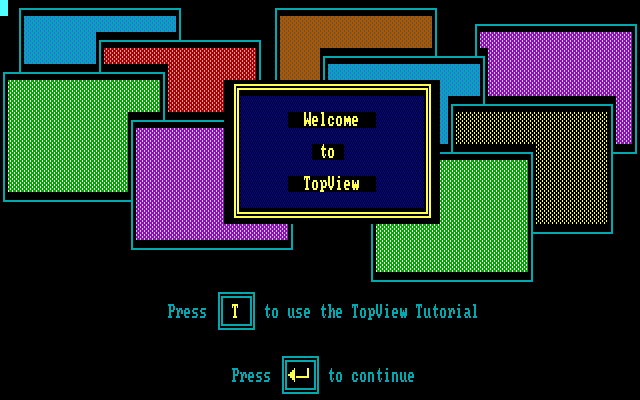 Those that did use TopView simply used it to multitask existing DOS application. Still, compared to TopView, the DOS multitasking support in Windows 1 was pathetic. Windows 1 would only run a handful of small, simple well behaved programs in a window. Almost none will actually multitask. Even then, Windows 1 was limited to tiled windows. TopView more directly competed with Digital Research Concurrent DOS. 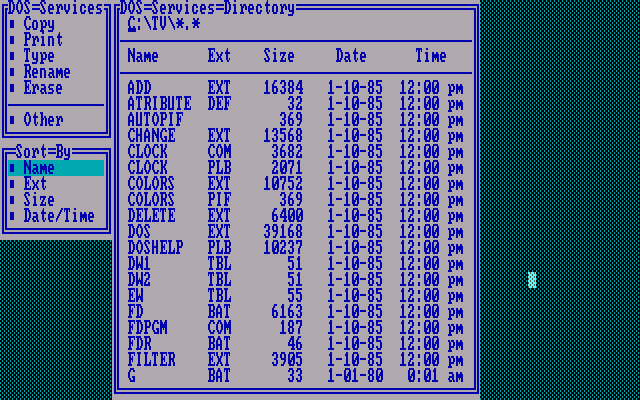 Eventually TopView was overtaken by DesqView, a more powerful DOS multitasking tool from QuarterDeck. And IBM shifted new application development focus to OS/2. IBM did release several updates. Version 1.1, introduced in June 1986, added support for the IBM PC Network and IBM 3270 terminal emulation. Importantly, support for swapping non-resident programs was added onto the hard disk on all computers and into the high memory area on machines equipped with a 286 CPU. The initially poor support for DOS batch files was improved. The final version, version 1.12, introduced in April 1987, added support for the new IBM PS/2 series, their DOS 3.30 operating system, and their new PS/2 mice. It could also now use up to four serial ports. We have added the original 1.00 release. Interestingly it looks like it didn't start shipping until the very beginning of 1985. Never knew IBM made this. Also, I would imagine that the reason IBM last updated TopView in 1987 when OS/2 came out is because OS/2 didn't have the Presentation Manager at the time, so they merely updated TopView while the Presentation Manager was being developed. IBM was fairly good about providing updates for their products, even after they left mainstream usage. Usually large corporate contracts were involved. In the case of 1.12, it was quite important as TopView does not use DOS mouse drivers. Instead mouse support is built in to the program, requiring a program update to add PS/2 mouse support. IBM really did try to lock people in with the PS/2 and MicroChannel Archtecture, but they did not realize how big the clone industry had gotten. IBM wasn't as relevant as they thought anymore and the industry gave MCA the finger. Thanks for sharing rare IBM Top View 1.00. Tutor disk seems to be made in 1984 and same as version 1.01's one. Yes, my best guess is they had the tutorial finished when it was first publicly demonstrated, but then continued to update the TV executable until the last second when manuals/boxes were ready to ship. Tweaking compatibility with newly released programs would have been a constant uphill battle.